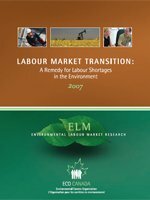 With the demand for environmental employees continuing to grow, it is critical that the environmental sector supplement traditional labour sources, such as post-secondary graduates, with emerging sources of talent, including immigrants and transitioning workers. This study focuses on the latter group and the current potential of the environmental sector to attract and retain these workers. As a preliminary analysis, this report represents an essential first step in the development of a strategy to help employers more effectively recruit transitioning workers from other areas of the economy.